This shows the trip home from getting a new, car. We are going through a forest on the way with only one car in front of us. Group of young people going to the trip by car together. Happy friends filming on gopro and dancing to music. 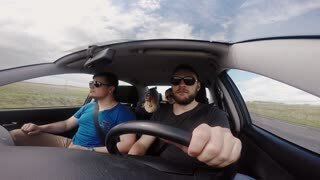 Time lapse: group of young people traveling by car and eat something sitting inside. Friends going to trip together. Group of young people traveling by car and eating something sitting inside. Friends going to trip together. Cheerful young man throwing luggage into the back of car before going on trip.